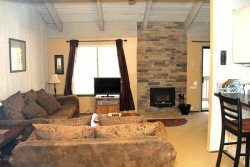 Nice, Cozy One Bedroom and One Bath condominium located walking distance to the Canyon Lodge Ski Lift Area in Mammoth Lakes. Sleeps up to 5.One King bed in the bedroom with one queen foldout couch, one twin bed, a one futon style chair that sleeps one person in the living room. There is a wood buring stove in the living room and a fully equipped kitchen to help make this your home away from home. Two flat screen TVs (LR,BR), 2 VCR`s, 1 DVD, CD. Wifi Internet access in unit. Phone in unit 760-934-1769 (780 sq. ft). The unit is all one level and you enter from an interior hallway in the Chamonix C Building. There are two outdoor parking space available. Chamonix Recreation room has large screen TV, reading area, ping pong, foosball, and business center with fax, copier, computers w/ internet and laptop hook-up. Sauna, hydro spas, seasonal/summer swimming pool & BBQ area. Coin-operated laundry facilities located in the common area near the office. COMPLIMENTARY INTERNET and CABLE TV are provided, however NO REFUNDS will be given for connectivity problems or Internet failure. TOT LICENSE 1968-CX53. This is a wonderful condo with an even better location just a quick five minute walk to the Canyon Lodge and ski lifts of Mammoth! We had a group of five, but we all fit really well and had an amazing stay. I definitely recommend this stay! Great apartment and excellent value. Kitchen stocked with everything you need to cook, comfortable bed, cozy, excellent location near to Canyon Lodge, would definitely recommend. Our expectations were that the place would be a bit cramped for 5 people, but when we arrived it was quite a bit larger than expected. The service was great - we needed extra linens and the closet had over 10 extra blankets. The condo complex has a hot tub, perfect after long days on the mountain. The walk to the ski lifts is quick and only takes 10 minutes with gear in ski boots; parking was never a problem despite the 3 day weekend, and restaurants and a supermarket are all within a 10 minute drive. I would highly recommend this place for a quick skiing / snowboarding adventure at Mammoth. Great space as advertised. Very cozy and serves its purpose when visiting Mammoth! Perfect location for walking to lifts, clean and comfortable place to stay for a mountain trip. Would definitely stay again. Great location and easy access to mammoth. Great place, nice to have real beds in the living room, kitchen appliances worked well. Great TV/DVD and very comfortable. So cheap and so close to canyon lodge. Not the biggest place but you cant beat the price and location . The three beds in the living room, are actually just couches, but they are wide and long enough to sleep on. Ive stayed at various units at this lodge and always found the location to be extremely convenient (steps to canyon lodge). The place is as described and the pantry is well stocked (no need to buy the basics such as oil, salt or sugar). I like how it is on the first floor so I dont have to carry my gear up and down the stairs. If the purpose of your trip is to ski / snowboard it is a perfect location. You can also ride the gondola to the village from Canyon lodge during operating hours. Overall, it was a great stay and would definitely book again. The staff and reservations is very friendly and helpful. The location cant be beat. Parking can be difficult on a busy weekend.